However “Dim screen when inactive” does nothing. As long as “Blank screen” isn’t “Never” the screen will dim whatever the toggle state. Conversely setting it to “Never” will always prevent dimming. What is “Dim screen when inactive” toggle supposed to set? dimming involves lowering the screen’s backlight (when possible) — the screen’s contents remain visible. if the system has been idle long enough, the screen is dimmed. So you’ll only ever see dimming on systems running on battery. The toggle itself only determines whether the screen is dimmed if the battery isn’t low, and the screen will then only dim for a short while before the screen blanks entirely. Not the answer you're looking for? 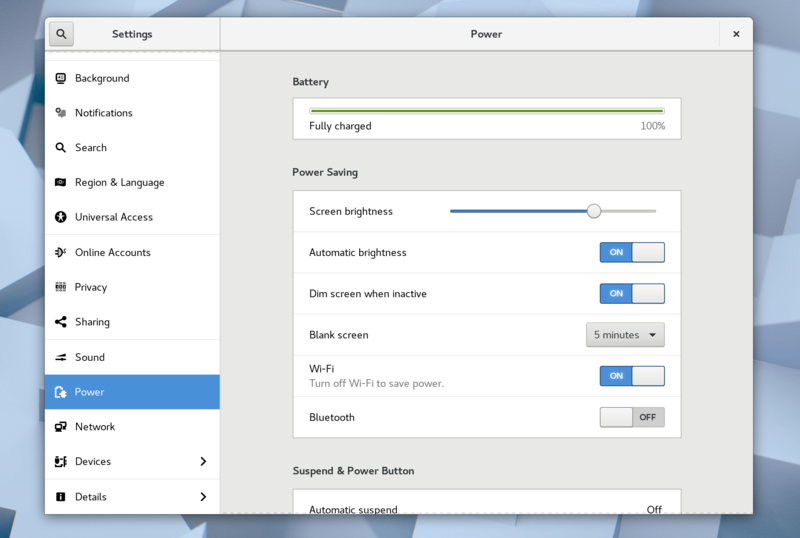 Browse other questions tagged arch-linux gnome power-management or ask your own question. What does this GNOME button do?